Mise en place, people! 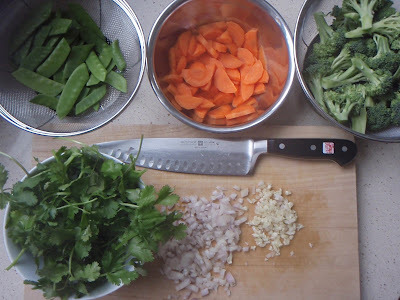 Mise en place is a French term meaning "to put in place". It is pronounced MEEZ ahn plahs. According to Epicurious the culinary definition of this term is "having all the ingredients necessary for a dish prepared and ready to combine up to the point of cooking." 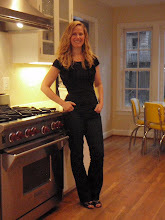 Mise en place also refers to getting everything prepared to start a recipe such as preheating the oven, getting out the correct pots or pans, having cooking utensils at the ready, etc. 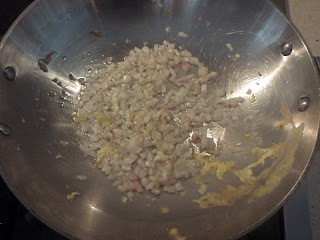 Those who don't cook or bake on a regular basis might not be practicing this very important "mise en place" --but I tell you, it is really essential to getting your recipes to work correctly. The time it takes to find the right pot or measure the correct amount of the next ingredient may cause one to make mistakes with a recipe --in baking (which is much more precise than cooking) it may even cause a recipe to fail. Wouldn't that be a shame? 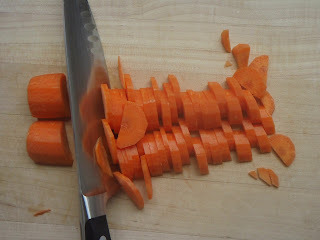 Mise en place is a good habit to get into. 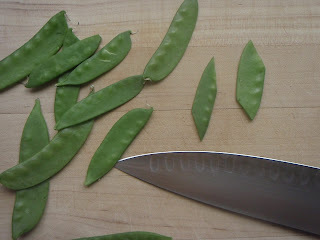 This recipe goes very quickly once you have your mise en place. 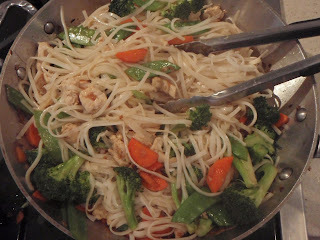 I found this recipe in a little pamphlet of recipes from the company Thai Kitchen. I adapted the recipe a bit. 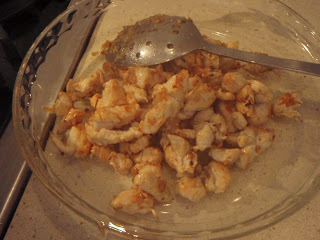 I also eliminated one of the key ingredients--peanuts. Two of my kids are allergic to peanuts so I don't cook or bake with peanuts. I personally love peanuts and would very much welcome the addition of some crushed, dry roasted, and salted peanuts sprinkled over this dish! 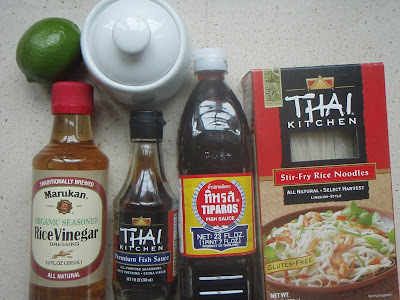 If you love to order Pad Thai when you are at your favorite Thai restaurant then I think you may really love this recipe as much as I do. 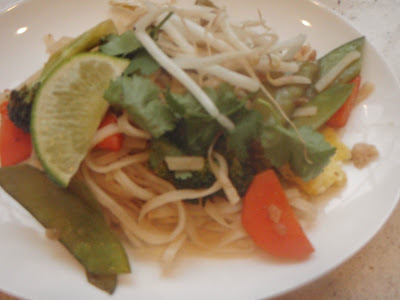 It is not an "authentic" pad thai but the flavors are fresh and wonderful. I hope you try it. Optional garnishes: sprigs of fresh cilantro and lime wedges. 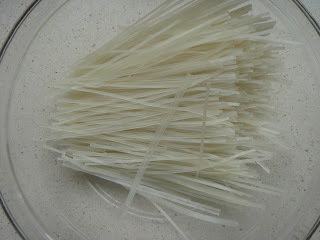 Soak rice noodles in boiling water for 5 minutes until soft. 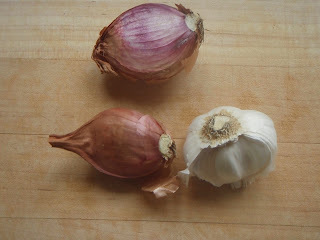 Rinse with cold water, drain, and set aside. 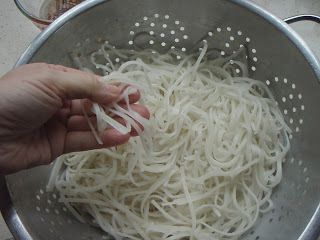 Alternately, the noodles could be soaked in cold water at least 1 hour (and even overnight). Drain all water and set aside. 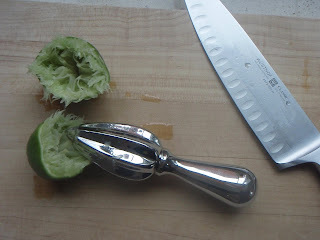 In a bowl, combine sugar, lime juice, fish sauce, and rice vinegar. Whisk well until most of the sugar is dissolved. Set aside. Heat 1 Tbs. 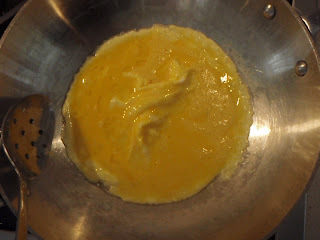 oil in a wok or frying pan over medium-high heat; cook the beaten egg until scrambled. Remove and set aside. 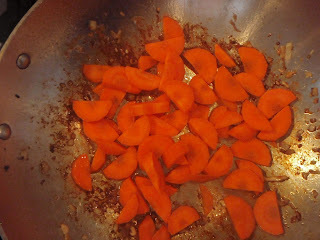 In the same wok or frying pan, heat 2 Tbs. vegetable oil. 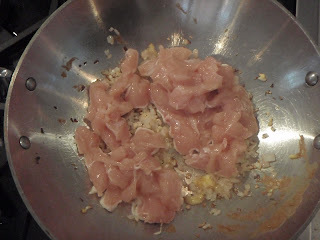 Add minced shallots and garlic, cook for about 2-3 minutes and add the sliced chicken or shrimp. 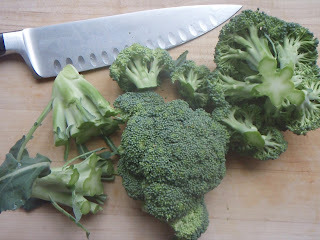 Cook for 3 minutes and turn pieces over using a large spoon or tongs, cover with lid and let cook through for 2-3 minutes. 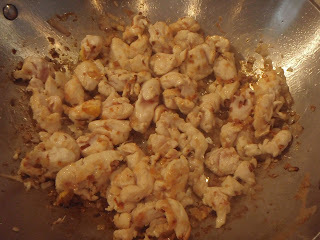 Lift lid remove chix to dish and set aside. Add 1-2 Tbs. 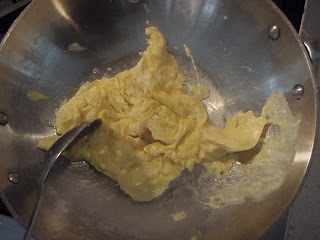 vegetable oil to the hot pan. 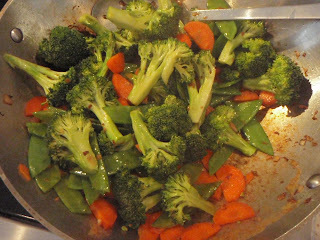 Add the carrots and cook for 1 minute then add the broccoli and snow peas cook for another 2-3 minutes, tossing the vegetables to make sure they are all cooking. 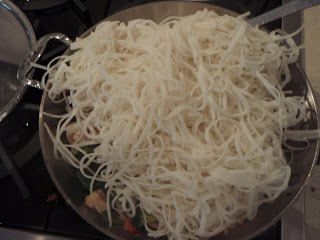 Add pre-soaked, strained rice noodles and sauce mixture. 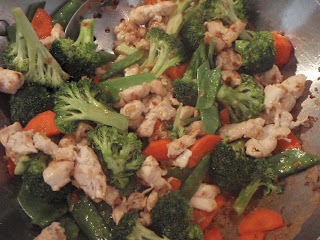 Stir-fry for 3-5 minutes or until all ingredients are well cooked. Use tongs to move vegetables from the bottom of the pan to the top and keep mixing all the ingredients to make sure everything is coated with the sauces. 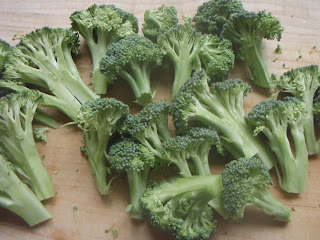 Reduce heat to low and cook for another 5 minutes. 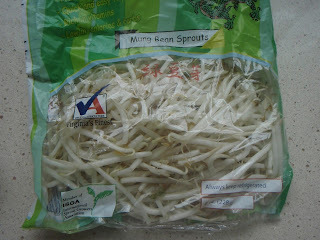 Add bean sprouts and scrambled egg. Mix well to combine. 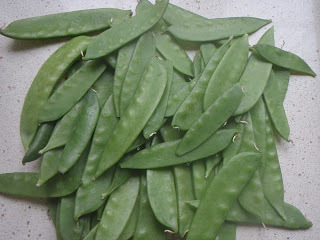 Serve immediately with lime wedges and cilantro.